Four stamps, each approx. 1-1/4" square. 1-1/4" x 1-1/4". Unmounted only. 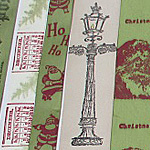 Stamped Holiday Ribbons by Design Team Member Rhonda Secrist Thomas. See the Supply List. 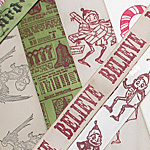 This is a follow-up to Rhonda's original post about Stamping on Ribbons.